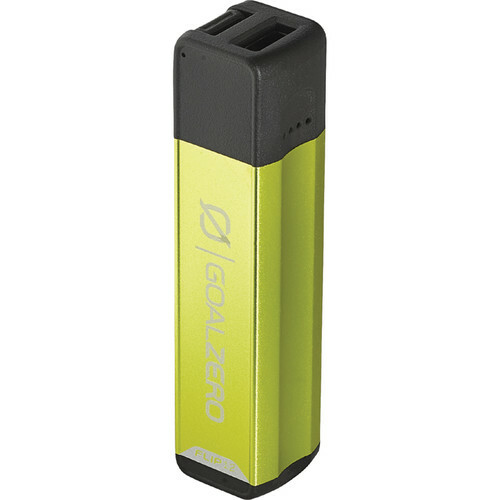 Ideal for keeping phones and small devices like cameras or GPS units charged up and ready to go, the green Goal Zero Flip 12 3350mAh Portable Power Station is a stylish and powerful power solution for anyone who needs to keep their gear going while outside or off the grid for a long weekend. A flip-out USB plug charges the 3.6V, 3350mAh capacity Li-Ion NMC (nickel manganese cobalt oxide) battery from standard USB computer ports or wall plug adapters, or plugged directly into many Goal Zero solar panels like the Nomad 5 or 7 Plus to get its charge. The Flip has a single standard USB output port that accepts your device's charging cord and outputs 5VDC (up to 1A, 5W max). Designed to be highly portable it measures just 3.7" long and weighs a mere 2.5 ounce.